Rays starter Matt Moore was at his best Sunday in the Rays' 3-2 win over the White Sox. The former All-Star struck out 10 batters in 6 1/3 innings, surrendering two runs on five hits to give Tampa a win in the rubber match of a three-game series at Tropicana Field. "Great series win there, that was a big one." Rays manager Kevin Cash said. "Pretty well-played ballgame." For the first half of the Rays' win, both lineups were overpowered by the opposing starter. Chicago starting pitcher Jose Quintana (1-1) struck out six batters in the first three innings of his six-frame outing while limiting Tampa Bay (5-7) to just two earned runs. 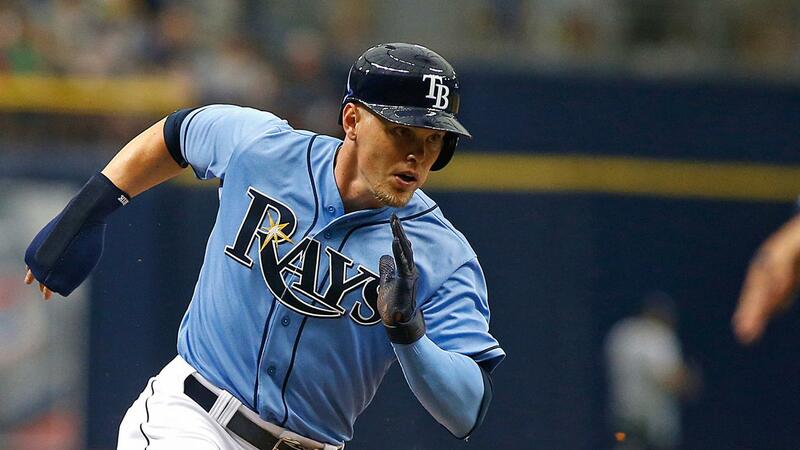 A double by Steve Pearce in the first inning drove in right fielder Brandon Guyer to give Tampa Bay an early 1-0 lead, and a single by Guyer in the third to plate Logan Forsythegave the Rays the lead for good. Guyer tied a career high with four hits to go along with two runs and an RBI. Moore's (1-0) afternoon started smoothly and efficiently with 21,810 watching. He only needed 10 pitches to get through a 1-2-3 first inning and then his parade of strikeouts began. He fanned Todd Frazier, Jerry Sands and Brett Lawrie in order for a 1-2-3 second, then struck out the side in the third around three baserunners. With two more strikeouts to start the fourth inning, Moore recorded eight straight outs by strikeout. "He had everything going today," Cash said. "It seemed like the changeup behind in the count seemed to be the big pitch. When he had a chance to put guys away, whether it was a fastball up or a curveball underneath, they were both really good weapons." "He was fantastic. It was coming out of his hand great," White Sox manager Robin Ventura said. "We scuffled. We're a swing-and-miss kind of team, and we've got some pop with it, but today he was just better." White Sox center fielder Austin Jackson singled to right field to plate Avisail Garcia for Chicago's first run in the third. Garcia, who went 1-for-3, also drove in a run during the seventh with a single to center to drive in Lawrie and chase Moore three batters into the frame. Enny Romero replaced Moore and threw a scoreless inning before Alex Colome recorded the last five outs for the first save of his career. Welcome back: Cash hoped to start Forsythe and Kevin Kiermaier after he gave them Saturday off following their potentially dangerous collision on Friday night. The manager got his wish on Sunday as both were back in the starting lineup and delivered extra base hits. Hurting his own cause: Quintana was solid against the Rays on Sunday, but the decisive run fell at his feet. With two outs in the bottom of the third, the starting pitcher raced to first base to cover the bag on a grounder by Logan Morrison. First baseman Jose Abreu's flip to Quintana beat Morrison to the bag, but Quintana's foot missed the base, allowing Guyer to score all the way from second base. "I had the base in front of me, but it was a quick play and I just missed the base," Quintana said. "Jose make a good job to get the ball and put me in a good spot, but I never saw the base." Saving the day: With Brad Boxberger beginning the season on the disabled list, the Rays were hoping Colome would step up and be the closer they could count on. Colome picked up his first career save in his first opportunity, holding down the fort to get the final five outs of the game. With two outs in the third, Chicago outfielder Adam Eaton tapped a ground ball to Pearce at first base, where his flip to Moore left the starting pitcher a split second short of catching Eaton. Cash challenged the out call, but the ruling stood after a one-minute, 23-second review. White Sox: The White Sox begin their first multi-series homestand Monday when they host the Angels at 7:10 p.m. CT. The White Sox split a pair of games with the Indians in their only two home games of the season so far. Rays: The Rays begin their longest road trip of the year so far on Tuesday with a three-game series in Boston followed by three more at Yankee Stadium. Drew Smyly getting the start for Tampa Bay against Red Sox starter Joe Kelly in the first game, with first pitch scheduled for 7:10 p.m. ET.